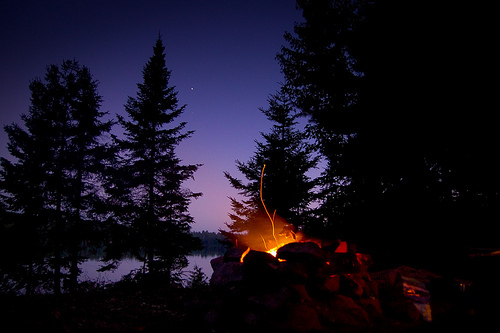 "The Enchantment of Nebula Stone"
For more than a quarter of a century, we have tried to find isolated and pristine natural places to camp and have fun. Since the early 70's while living in the Southwestern Mountains of Colorado, we would often venture a highway… south of the border with our dog, Pluto, to spend the early spring months. One soggy spring, after too many months of cabin fever, we left our home in Telluride, crossed over Lizard Head Pass waving at the cross country ice skiers and headed south. It was during these adventures our long journey began, that over time would bring us to a very special place. Many times, on our trips, in the early mornings, we'd climb to the mountain or ridge tops watching the earth come alive with the rhythms of the Sun. Throughout the years, we visited many little villages enjoying the people and exploring the Mexican, Belize and Guatemalan back roads. On about four different occasions, while sitting atop the ruins or high ridge tops, we felt as though we were being pulled to venture farther towards the land in the distance. One time we would be pulled to the mountains in the northwest direction and another time, hiking in a far distant area, we were strongly compelled towards mountains in the west. We’re sorta like the bear that went over the mountain "to see what he could see"…but these times were different…more alluring, like we had to know..., like we just had to see what was over those mountains, but there were also a lot of other places we wanted to explore on our trips and at that time we didn't take this alluring stuff too seriously. As time went by we got some maps and plotted the places we had climbed and found that those four special times encompassed a large area. They formed a rough triangle…then... hmmm...it occurred to us…those four places surrounded one central location. One year we found an obscure, narrow, rutty, muddy trail that went towards the mountains. It took a lot of clearing vines and brush, but we finally got way back in there and set up camp. Dawn arrived with squawking parrots, we grabbed our backpacks with some tortillas and water and started climbing. We were finding our way through the trees and brush, sometimes finding parts of what looked to be a path from long ago, losing it, and then farther uphill, crossing parts of it again then loosing it again. The climbing was getting to be pretty rough going, using our hands a lot and heading towards a high saddle between the mountains. We were getting excited. After all these years, it seemed we just might have found a way in. Farther up the mountain, nearing a high pass between the ridges, we found a part of the old path again which led between two ancient trees amongst the tall cliffs and boulders. Atop one of the trees were two crows that watched as we entered. We stopped between the two old trees to catch our breath and get a swig of water. The two crows talked together for a bit, then flew over our heads, cawling as they disappeared to the left in the clouds. We followed as the broken trail turned left and went up and over the narrow pass between the mountains, then started winding downwards. 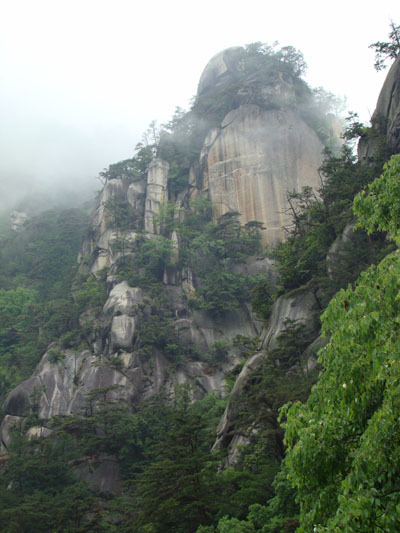 In the mist of the low hanging clouds, a faint trail seemed to descend between two steep ridges. Was it an animal trail or an old path? At times it would fade away, where rockslides, vines and trees and brush had long ago reclaimed the mountain...and then further on little parts of it would reappear. Now and then, at a distance, through the branches and misting clouds, we would get a glimpse of a valley off to the left and below us. Crossing a deep canyon to our left, then scrambling up through the brush and cliffs, we finally reached a ridge top and found a low tunnel-like animal trail through the thick growth which seemed to follow the ridge downwards into the hidden valley. As we descended, the clouds started to lift, offering a sweet new fragrance floating on the breezes from the valley below. The air was crisp and clean, reviving us with renewed energy to venture farther down and deeper into this hidden land. We came through a large forest of trees, and down below, we saw two deer of the forest rise from their bed's, look at us for about a half minute, then begin feeding on the flowers 'neath the trees, as though we weren't even there. Walking through the forest the land soon widened and opened to rolling hills and a flowered meadow. 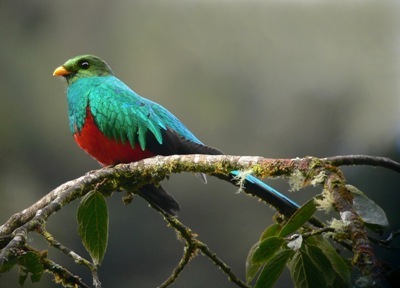 There were a lot of brightly colored birds singing and flying about. The place was just beautifully alive. Looking at each other and then the valley we walked hand in hand through the golden field ....not whispering a word. Do not know how to adequately convey in words what we were feeling. Everything was lush and vibrant with many old trees watching over the valley. We felt as though we had entered a land of ancient times. This was a very special place...almost...magical. Coming to a little wooded hollow we sat under the old trees. We spoke of how serene and peaceful this hidden valley was...where even the birds and animals were curious. In all of our wanderings, we had never found any place like this before. After munchin' corn patties and gulping down a lot of water, we felt refreshed. What a beautiful day it was to be with your best friend, in a most wondrous place. The sun had risen higher and was just now peeking over the mountaintops, slowly shedding light under the shadowed tree's edge. We stepped from the cool shade of the trees into the warm sunlight to a grand view of the valley and the land beyond. It was here that we found the stone we came to call Nebula Stone. At our feet in the fresh sunlight were these beautiful stones shining with the morning's dew. The first time we held them in our hands, we found them to be very smooth and felt gentle and soothing to the touch. 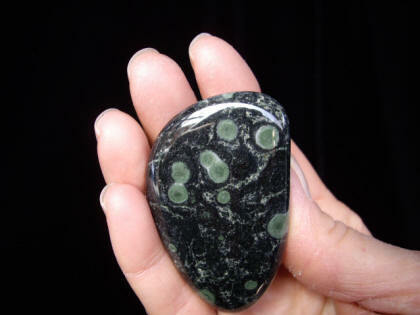 They had cosmic green eyes (spherulites) floating in the glistening deep dark-green (almost black) stone. As we looked at the green eyes it looked as though we were peering into the night sky. Some of the eyes in the stone were various shapes and sizes. Many appeared near, while others seemed to lie deeper in the Universe…like looking into the cosmos. 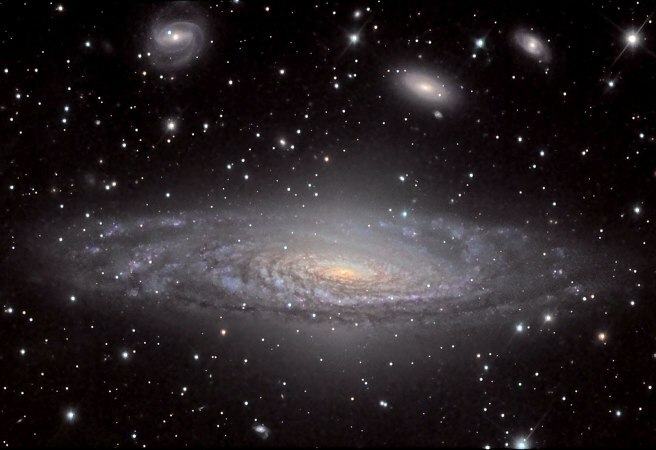 Some appeared as spiraling Vortexes and swirling Nebulas and others as Earths, Moons and Galaxies, while the centers had crystallized forming star-like filaments of light vorticing towards the nucleus, with Quartz scattered throughout the stone... appearing as the Milky Way with Stars and Stardust and shooting stars. The look of depth and elegance made each Stone unique. These Stones were as Enchanting as The Valley Itself. Well, after finding the stones we took our stones to the Tucson Gem and Mineral Show (the largest in the whole World) to find out what they were. Over the course of a week, we learned that none of the experts from around the world could identify them. They said it was a new find and that we could give it a name. We sent thin section samples to various universities, and National Museums. 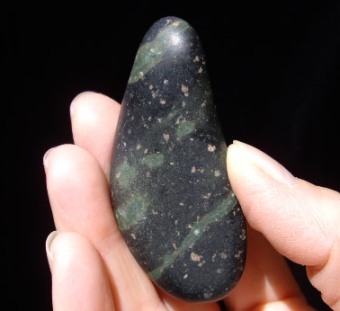 First the Smithsonian Institute said it was a new orbicular nephrite, a new variety of Jade... and The American Museum of Natural History said... "It is unlike anything any of us have ever seen". Dave Douglass, U.C.L.A. 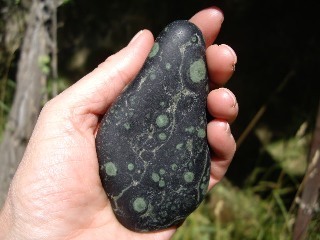 researcher had it analyzed and wrote “in conclusion, I think it is Jadeite, and perhaps a special version of Chloromelanite Jadeite.” It seems from the expert opinions the Stone appears to be a unique combination of some of the constituents of Nephrite Jade and Jadeite. Cutters have told us it cuts like Jadeite and takes a high luster polish like Jadeite and is as tough as Jadeite. Well, we were told this was a new Gem discovery. Boy... that just about... knocked... our socks off. We learned that It contained a rare unique combination of green Quartz, Aegirine, Acmite, Arfedsonite, Anorthoclase, Riebeckite and Zircon, and other minerals "With numerous (microscopic) terminated Quartz Prisms (points) in the matrix". 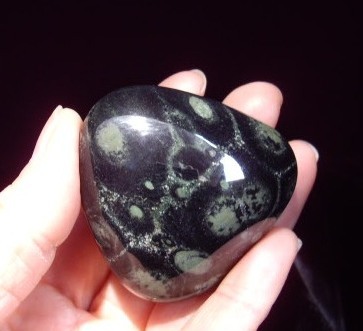 The stone has a deep green Quartz matrix background, almost appearing black, interspersed with nebula like formations of light green eyes. The lighter white colored veining is self healed Quartz (microscopic formations of new Quartz points). Nebula Stone is unique in it's composition of Minerals. On the Mohs scale of hardness, it is about a 6 1/2 to 7 hardness and takes a brilliant polish, with a toughness of Jadeite making it an excellent gem and carving material. When we first found this stone, we did not know it would be a new Gemstone in the legendary Gem and Mineral Kingdom. Neither did we know that we would get calls and emails worldwide from Museums, Journalists, Collectors, Jewelers, Retailers, lapidary enthusiasts, Carvers, and that it would become sought after also by Collectors, Mineralogists, Massage Therapists, the Spiritually inclined, the Esoteric and Metaphysical community, Psychics, Astrologers, Healers and Reiki Masters, the Healing community and by people who simply love stones. All of this was new to us. Around when we first moved to the little mountain town in the early 70’s we worked for the Idarado Mine during the last months of its active mining days. This brought us to get to know one of Telluride's most cherished old timers…our shift boss…George Cappis. He was truly a gem of a man…as beautiful as the best crystals that we packed in our pie cans as we rode the man trip out of the mine. We had crystal specimens inside and encircling the outside of the house but that was about the only experience we had had in the Mineral world. Thinking back in time about all the superb mineral specimens we had collected we soon learned that there was something even more appealing about these new stones we had discovered. Don’t know how to describe it, but people really liked holding them and were drawn to them, sort of like how we were drawn to the hidden Valley. All of this was unforeseeable to us. Nor could we foresee the coming adventures, the many places, and the intriguing bigger than life characters we would encounter in the fascinating and dazzling Gems and Minerals World. 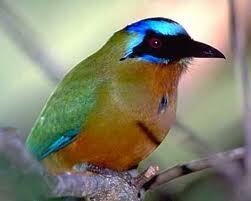 They are very entertaining and come in many facets, all shapes and colors, and countries, just like Gemstones. We met a rare few that were exquisite Emeralds and some were Diamonds and some, diamonds in the rough. A few, sadly, were like chunks of coal who crawl out from the woodwork wanting to jump on your wagon. We met a lot of people in the business from around the globe making many lifelong friends. There were many experiences that lay along the path this stone from the gifted valley would take us on, unfolding right before our eyes just like a real life adventure on The Big Screen. Our newly Discovered Nebula Stone was written about by Rock and Gem and Lapidary Journal magazines, Colored Stones, The Book of Stones, Rocks and Minerals, Simon and Schuster's Rocks and Minerals Reference Guide, The Metaphysical guide, Melody's Love is in the Earth series "Kaleidoscopic Pictorial Supplement Z, Melody's "Crystal and Mineral Encyclopedia", The Crystal Buzz by Katrina Raphaell, Hazel Raven; The Secrets of Crystals, Personal working knowledge, The Basics of Feng Shui, Crystal Astrology, Gem Water by Joachim Goebel, Charmed by Gregory Branson-Trent, Desert of the Damned by Kathy Kulig, The spiritual Flower by Virginia Santini, Natural Medicine First Aid Remedies by Stephanie Marohn, The Crystal Bible by Judy Hall, Crystals for Beginners by Corrine Kenner, The Crystal Zodiac, Mystics, Gemrocks, Stones Alive by Twintrees, The Magic Power of Stones Crystals and Minerals: Marie Nilsson (Sweden), Kameny od A a do Z by Judy Hallova (Slovakia), GEMS: by Robert Webster, Ish Gisella Cannarsa (Italy), David Federman Colored Stone Magazine, Rocks and Minerals, Crystal Prescriptions by Judy Hall, The Encyclopedia of Crystals by Judy Hall, Michael O'Donoghue and others, Katrina Raphaell's new book in English, Japanese and Italian "Illuminazione Cristallina", and many others. Back when we first found the stone and learned it was a new discovery we had the privilege of giving it a name. At first we didn't know what to name it. We even, humorously, said "how about naming it "Ron & Karenite" or "KaRonite" beings many gemstones end in "it" or "ite". But of course, that wouldn't be fair to such a unique new Gemstone. So... one evening while we were sitting at home sipping a glass of wine, Ron got the specimen from our mantle, sat back down, dipped it in his wine and held the shinning Gem up in the light. He then said..." Honey, it’s just like looking at the Earths, Stars and Galaxies and Nebula in the Cosmos". Nebulae are cosmically immense clouds of gas and dust which whirl and twirl in space, vorticing inwards, condensing and... creating new stars and star systems and new life. were first born from nebulae. 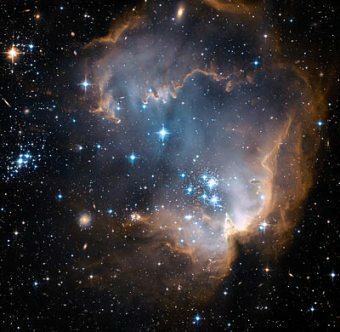 was once the matter of a luminous nebula....and will be again. 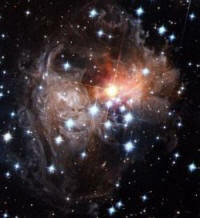 Birthing new Star Systems, Reincarnating the Universes with new Planets and the beginnings of New Life. The reason that we named the new Discovery Nebula Stone was because of it's symbolism of Creation, Life, passing on, to Rebirth and Continuance. 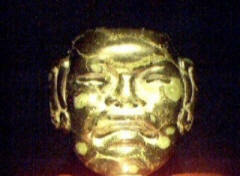 Nebulae are symbolic of Reincarnation. They are continually rebirthing the Cosmos. Nebulas are Crucibles of Creation. That's why Nebula Stone has become known as "The Birthstone of The Cosmos"
"Billions and Billions of Stars Reincarnating the Cosmos"
are the birth of new Star Systems and the beginning of Light...and New Life. Our Cosmic Dance brings one full circle from creation, through life, to passing on, to... rebirth...unending... " The Circle of Life "
The Universes are continually rebirthing themselves. The Cosmos and Reincarnation are ONE. Both…looking...into The Eyes of Creation. Just like the Nebulas, Just like Ourselves, Everything is Reborn and Continues. 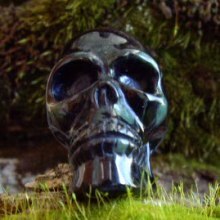 Since first Discovering Nebula Stone we have carved our Nebula Stone into Nebula Stone Jewelry, Pendants, Cabochons, Oriental Snuff Bottles, Crystal Spheres, Skull Pendants, Nebula Stone Crystal Skulls, Bear, Turtle and Frog Animal Carvings, Goddess Pendants, Nebula Vortex "The Circle of life " pendant and Lucky Turtle Shell Pendants. With the natural shapes being the Palm Stones and Pocket Stones, Nebula Nuggets, Tumbled Stones and Massage Stones. The Chocolate Galaxy Stones and Super Nova Stones are not sold to stores, we find very few and these are sold to collectors or individuals. Having never been involved in the Gem and Mineral World before we never knew the many ways in which stones are used besides jewelry and carvings: we've been learning that Nebula Stone is also widely called the "Stone of Rebirth", and the "Stone of Reincarnation" and is sought after by Healers, Therapists and Seekers, that consider Nebula Stone to be the Premier Healing Stone and are highly regarded by many people of faith as cherished Prayer Stones, used as viewing stones in the Orient, and prized for contemplation and Meditation, Reiki, Body layouts and Feng Shui, Astrology and Psychic work. 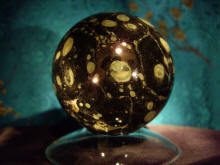 Nebula Stone is also being used for Chakra Work, Energy Grids and prized as favored stones for Hot Stone Massage. Dynamic displays in Aquariums and from our own and professionals experiences... most excellent personal Massage Stones. We had no idea their were so many uses. All of this has simply knocked our socks off. And to think... all we and Pluto were doing many years ago was going to... venture a highway. Keep a twinkle in your eye. "We are made of Star Stuff." Yours is one of the nicest Web-sites we have seen on the Web. You guys have some very beautiful things. 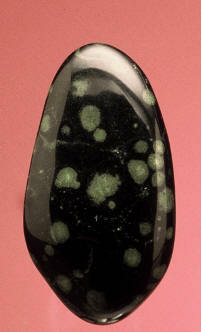 We've put Nebula Stone in our "Favorites"." To place an order, please go to our Contact page or Call us. 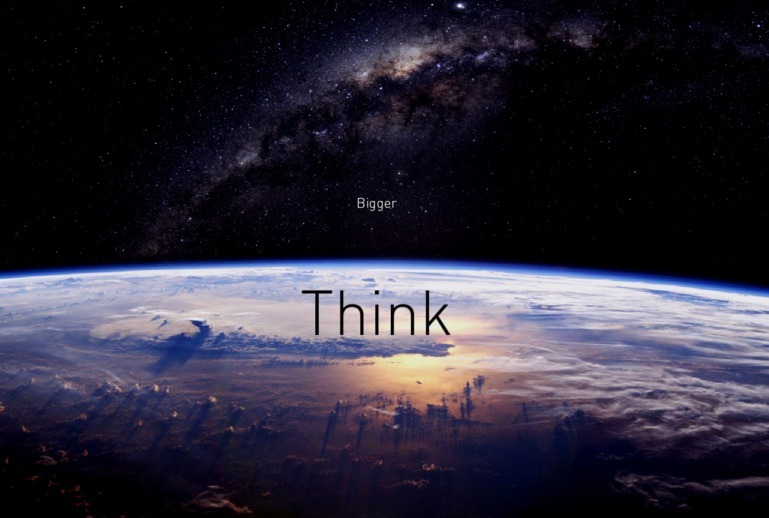 Please see the New TV Cosmos series on Fox TV. If you wish you may share our link with others, just copy and paste nebulastone@nebulastone.com into your email.